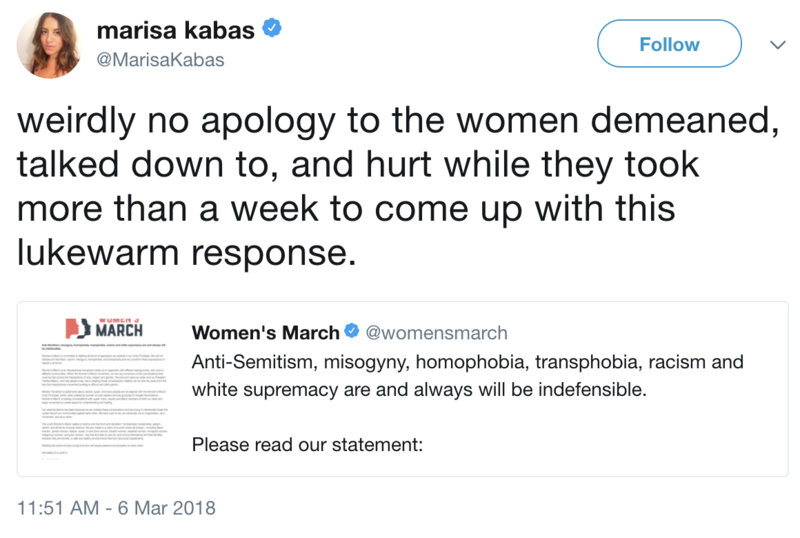 Women’s March is officially in damage control mode. Women’s March co-founder Tamika Mallory attended a Nation of Islam conference Feb. 25 where Farrakhan railed against Jews and white people. Farrakhan praised Mallory by name, and she was seen applauding during his speech. Mallory initially defended Farrakhan by implying that religious leaders are supposed to consider Jews their enemies. “If your leader does not have the same enemies as Jesus, they may not be THE leader!” she wrote. 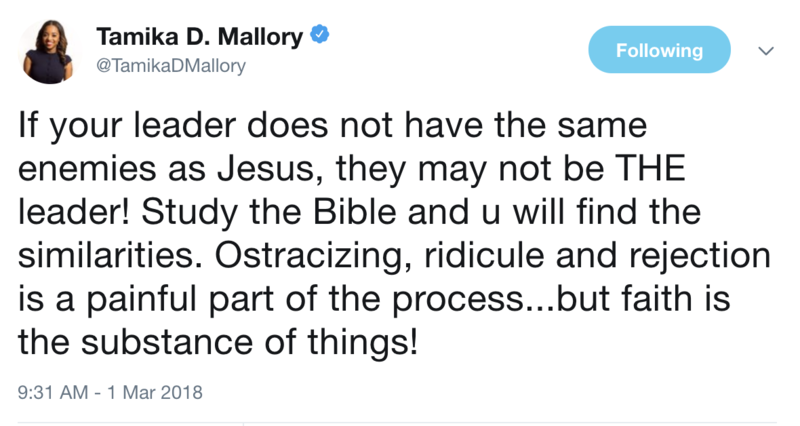 Mallory isn’t the only Women’s March leader with ties to Farrakhan. The group’s co-president, Carmen Perez, defended him in a January interview with Refinery29. CNN anchor Jake Tapper on Monday called out the Women’s March leaders and Democratic Illinois Rep. Danny Davis, who defended Farrakhan and called him “an outstanding human being,” for supporting Farrakhan. “Why is it so tough for some people to condemn a rabid anti-Semite who is also a misogynist and anti-LGBT?” Tapper asked. 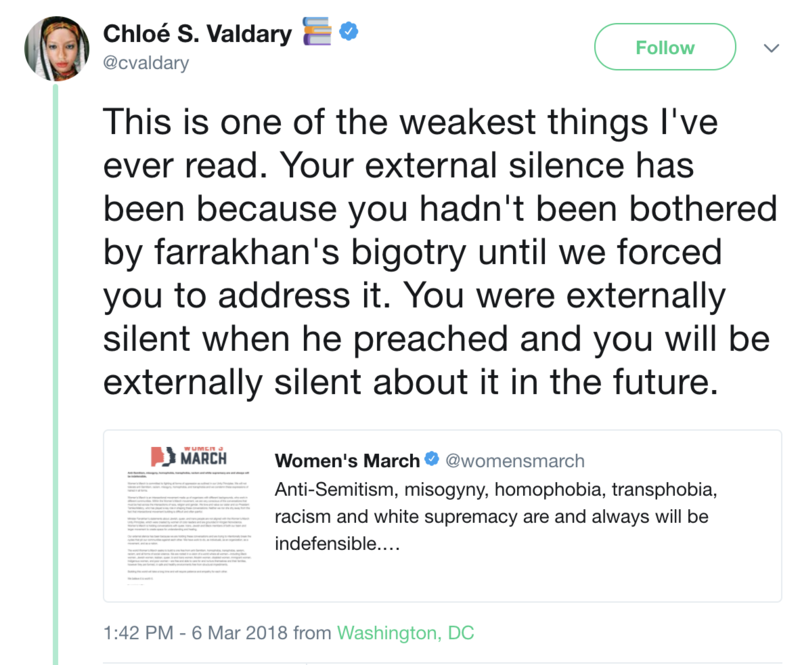 Since Mallory’s attendance at Farrakhan’s speech became public, Women’s March has faced sustained pressure from groups like the Anti-Defamation League, a Jewish civil rights organization, to cut ties with him. So far, they have refused to do so. 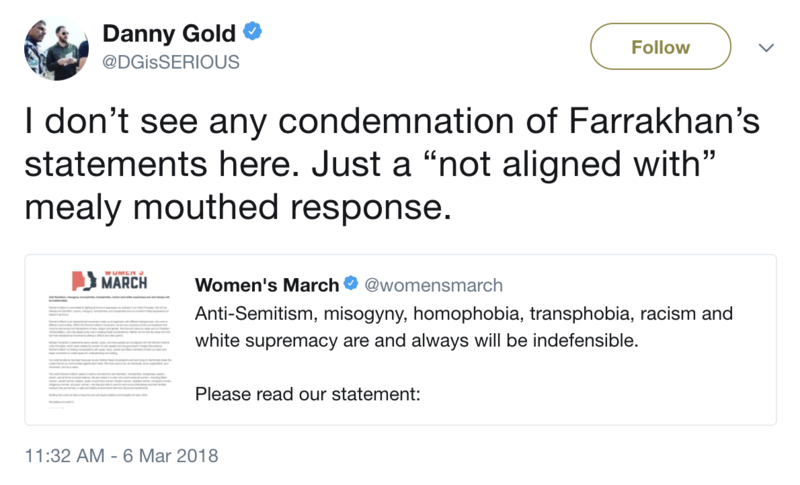 Under pressure from conservatives and liberals alike, Women’s March released a statement Tuesday excusing the group’s silence on Farrakhan. 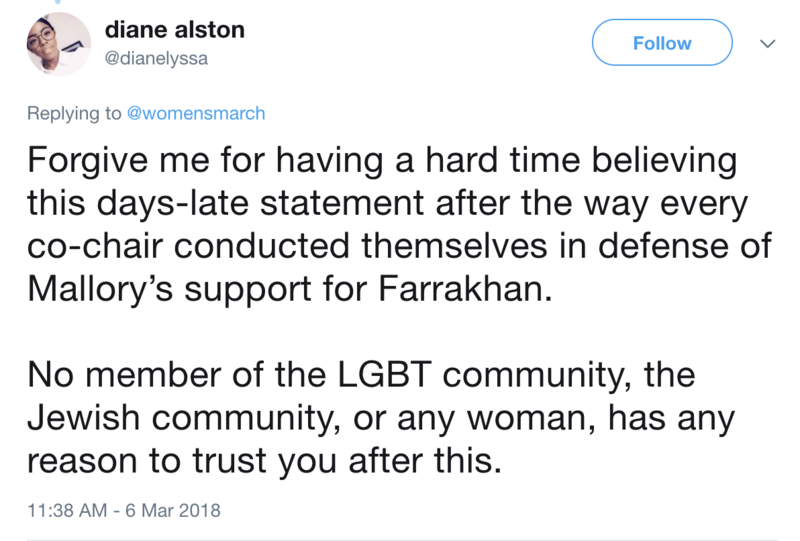 “Minister Farrakhan’s statements about Jewish, queer and trans people are not aligned with the Women’s March Unity Principles, which were created by women of color leaders and are grounded in Kingian nonviolence” the group said in a statement, which included neither an apology nor a disavowal of Farrakhan. 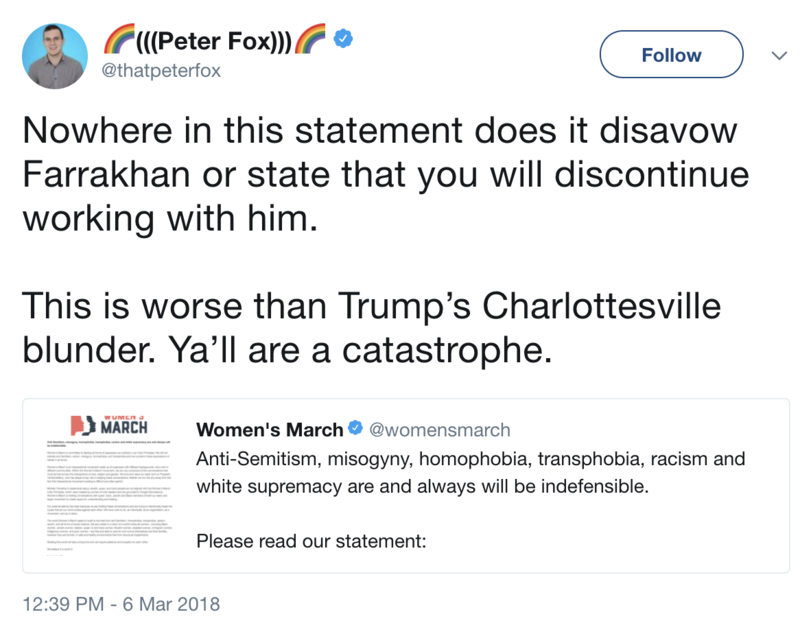 The group’s refusal to denounce Farrakhan in the statement immediately sparked a backlash on social media, especially from progressives who felt Women’s March leaders are being hypocritical for their closeness to the extremist. The Women’s March leaders aren’t the only prominent political figures on the Left who have known ties to Farrakhan. Rep. Davis is one of seven House Democrats still in office to have attended meetings with Farrakhan while in Congress.